Why do some smallbusinesses succeed whileothers fail?That is the question one young entrepreneurfaces in this illuminating business parablefor our times. Loops reveals the soul-searchingstory of Tony, a business student whodoesn't understand why he can't quit schooland work in the family business. Then his professor surprises him with an unusualfinal exam-a twelve-week, summer-longstudy of the small businesses in his localarea. This simple real-world assignment opensTony's eyes to the most important lessons anentrepreneur can learn, such as how to:Manage "experience zones"Build strong customerrelations through "visionmoments"Standardize key processesfor employeesInnovate, improve, andmaintain qualityAccomplish real results by"closing the loops"As you follow Tony's journey, you'll receivea week-by-week crash course on theseven essential loops for small business. 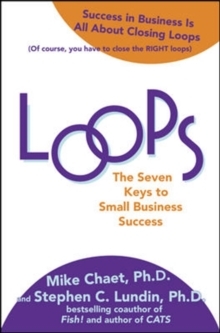 You will learn how to distinguish yourselffrom the competition, improve your operations,and close the loops. Best of all,you'll discover innovative ways to apply theloops concept to every challenge you face,with every endeavor, in any economy. When you close the loops, you open thedoor-to limitless opportunities.